Since President Obama has said that he supports gay marriage, the religious right is now having a fit. They are ever-so sure that their god hates homosexuality and by golly, their magical book says it! One of the more amusing people being so sure that they are the only TrueChristian is Ken Ham, he of the Creation Museum in Kentucky and Answers in Genesis, that font of lies, misinformation, attacks on long since superseded science and quote-mining. Let’s take a look shall we? What I find amusing is that Mr. Ham is intentionally sinning himself and causing others to sin. And for what? Money. 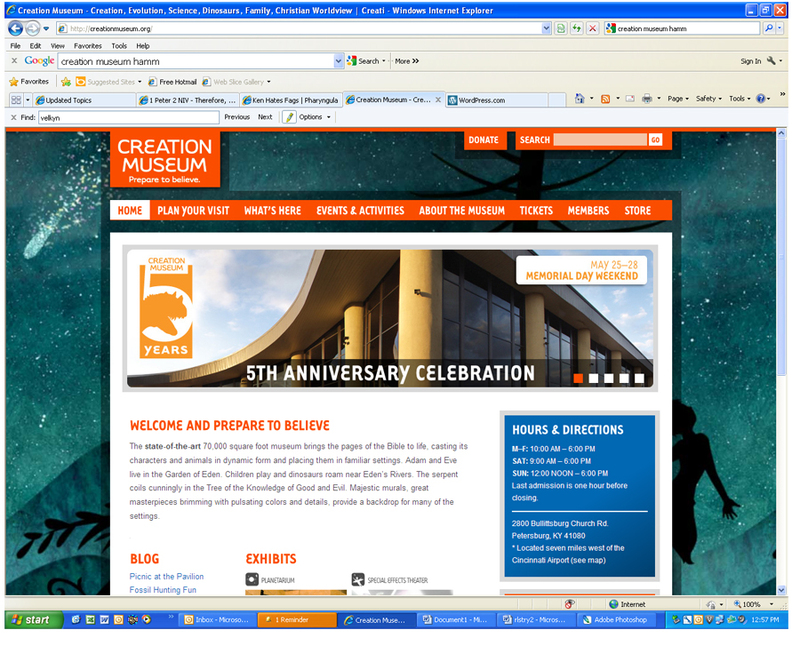 $30 ($16 for children 5-12) for admission into his Creation Museum. On Sundays! Yep, right there. Sundays open from 12 to 6. Stone the blasphemer! Pity. Mr. Ham, like so many people is quite a hypocrite. He decides that since he hates homosexuals, his god does too. His god does, but Mr. Ham also decides that the laws he doesn’t like magically don’t apply to him. But we already knew that Ham was a hypocrite. He uses that same science that he’s sure is wrong every single day. Being comfy is a lot more important to Mr. Ham than actually being honest. Given the antiquated and self contradictory nature of the Abrahamic book of myths, AKA the Bible, it is actually quite impossible to state that you follow it and NOT be a hypocrite in some fashion or another. Regardless of the claims of Fundamentalists, they use a magic decoder ring just as much as Catholics do.